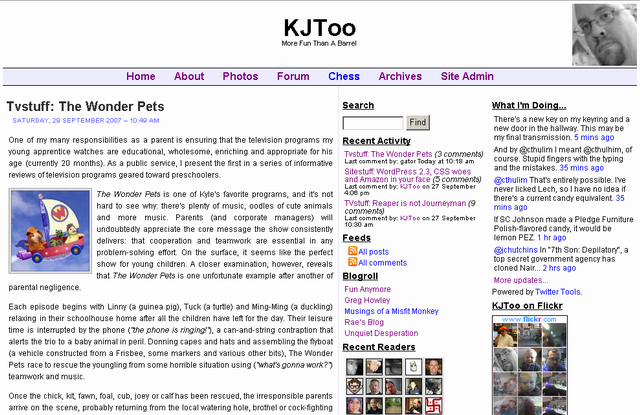 CSS | Kris Johnson's Blog…sort of. Sitestuff: Theme work in progress. I spent a good deal of time this weekend fiddling around with the Sandbox theme from plaintxt.org. Plaintxt.org is the brainchild of Scott Wallick, and he describes it as “[m]inimalism in blogging: an experiment out of control”. In the two and a half years since I installed WordPress, I’ve used at least three of Scott’s plaintxt.org themes: Barthelme, plaintxtBlog and now Sandbox. Where Barthelme and plaintxtBlog are both fully developed from a visual standpoint, Sandbox is more like a blank slate upon which a design can be built; think of it as an unfrosted cake ready for anything your imagination (and your skill with a tube of colored frosting) can throw at it. If you’re familiar with the old look of the site, it might appear that all I’ve done is shift the left sidebar over to the right, and there’s good reason for that: my goal was to, in essence, recreate the basic look of Brian Gardner’s Blue Zinfandel theme, but with two right-hand sidebars instead of one on either side of the main column. Ultimately, the changes to the design will be significant enough to fully distinguish it from Brian’sI’ll start by designing my own post-separator graphic., but I thought it would be interesting to see if I could mimic at least part of his crisp, clean look using Sandbox as a base. I’m pretty pleased with the outcome so far. There are areas that still need work (the far right sidebar has a tendency to drop out of place when viewing a single post with Internet Explorer, for example), but the basic look is coming together nicely. I’ve had one person tell me they’re not a fan of the dual sidebars on the right-hand side, but I don’t think that’s going away anytime soon. As always, I encourage anyone with an opinion on the design to share it with me in the comments. I know that the archives and library pages are a mess right now, and I’ll post an update when I’ve fixed them, but if you see anything else that seems out of place, needs improvement, or is just plain ugly, let me know. I’ve tentatively chosen Blue Zinfandel 2.0 by Brian Gardner as the base theme for the blog. I had about a half-dozen themes selected as possibilities; Blue Zinfandel is the one Laura liked best. One thing Laura doesn’t like is the typesetting in the header and the general lack of color throughout. I can see what she means, but I haven’t figured out what to do with it yet. A couple of days ago, I read an article over at The Thinking Blog about David Airey, a creative designer and blogger who updated his site design based on feedback from his readers. I’d like to do something similar here. Unfortunately, I’m not a graphic designer and my HTML/PHP/CSS skills are intermediate, at best. Nonetheless, if you’d like to provide feedback and suggestions, I’ll see what I can do to make things better. Today is the first annual CSS Naked Day, and if you’re viewing the site on 05 April, it’s going to look very… plain. The CSS, or Cascading Style Sheet, is what makes the site pretty and keeps everything where it’s supposed to be. Everything from colors to font styles and sizes to how lists are handled is accomplished through CSS, and today I’ve disabled CSS on the site. Well, on the blog. I didn’t mess with the forum or the photo gallery because, quite frankly, doing so would involve some serious effort on my part. I’m nowhere near as familiar with the inner workings of SMF (the forum software) or Coppermine (the photo gallery software) as I am with WordPress (the blog software). Maybe someday I’ll replace everything with a true CMS and I’ll be able to turn off CSS for everything with ease. Until someone designs a CMS that does everything I want it to and does it elegantly, though, I’m sticking with separate applications to handle the separate functions. Anyway, enjoy (or despise) CSS Naked Day. Tomorrow, everything will be back to what passes for normal around here. Prior to 1 November, display a countdown to 1 November. Note that I didn’t account for the time difference between Willoughby and my server location (Chicago), so it’ll be an hour off. Beginning on 1 November, display a progress bar and a daily target line. The progress bar visually represents the percentage of completion, while the target line displays the ideal word count based on writing 1,667 words per day. Target word count is also displayed numerically beneath the progress bar. Upon reaching the overall target word count (50,000), remove the daily target line (and corresponding target word count) and display a message indicating completion. That’s the theory, anyway. I’ll be the first to admit that this little widget is extremely kludgy. Most of the CSS that makes it work feels like a big, fat, inelegant cheat. Oh, and of course it doesn’t look quite right when viewed with Internet Explorer. The real kicker is Opera. The version I’ve got (7.0, which I paid for) shifts the whole blasted sidebar about 500 pixels to the right, way off into Never-Neverland. Maybe I should download the latest version. I hear there’s no advertising on the free version these days.